Grandma Slump: How Many Light Bulbs Will I Need to Hoard? There's been big news about light bulbs. They're not going to make them anymore. They're being replaced by a more squiggly higher priced thing. I had some of the earlier models of these. You turned on the light and by the time you took a pee it was just getting close to being bright. Obviously I prefer the classic bulb, that's ready when you are. You click it on and it beats you to the toilet. There's never any doubt where everything's going, since the vagaries of things pressed against underpants for eight hours never guarantees a straight stream.You have to eyeball the eye. I wish I would've started hoarding bulbs a year ago, when they were still manufacturing them. Now, with 2014, everyone's snapping them up and it's illegal, I guess, to make more. But still, I suppose since drugs have been illegal forever and dopeheads still get them, it's not beyond all hope that classic bulbs will pop up somewhere. I'm thinking -- unless I do have a shady rendezvous with some shady supplier under a dim streetlight -- I might really have to get on the stick and find some. I have a few bad sockets in which the bulbs don't last that long. The last thing I want is to buy $9.99 bulbs for a month and a half worth of good. I need a steady supply of the cheaper stuff. But where to go? Walmart might be out. Everyone's going to think of going there. Instead, what I'm thinking, there's all those cheapo closeout places, where they get unsold freight from who-knows-where. I know a place. It's junky as hell, but if you dig you can find some unusual things. Christmas trees all year long. Candy 10 years old, the kind where the ingredients are so mottled you have hallucinations, the good stuff. I used to know a guy who knew a guy who found things you can't find, like Walkman cassette players. Which I also should've hoarded. Next, how many will I need? I probably go through 20 bulbs in a year, mostly 60s but a few 40s. I'd seriously love to have some 75s for my garage, since it's hard to find anything in there with a 60. But I could use a 60 if I had to, then I'd want to accentuate it with a flashlight, or two 60s in side-by-side lamps. Now, if I need 20 bulbs a year, and I'm virtually 61, if I live till 80, that's 19 years, 19 x 20 = quite a few ... I might need to space them out. Use a few, then not replace them for a year. That'd cut back on, let's say, 10 a year. Tough but doable! The good news is I might not even live till 80. My dad didn't make 70. I mom just barely missed 80. That would be 12 years between the two. Split the difference. I could easily die anywhere between 73 and 76, meaning I've just saved four years worth of bulbs at the least, which is a savings of 80. Getting easier all the time! If I could just die at 73, or maybe 72 with a little willpower, that'd be 160 bulbs. So it's suddenly very manageable. And, if I stepped it up and quit exercising all together, and ate a few more full slabs of fatty ribs, breakfast, lunch, dinner, I might not even have to worry about it. This is serious business. I can't believe the government screwed us over on this deal. 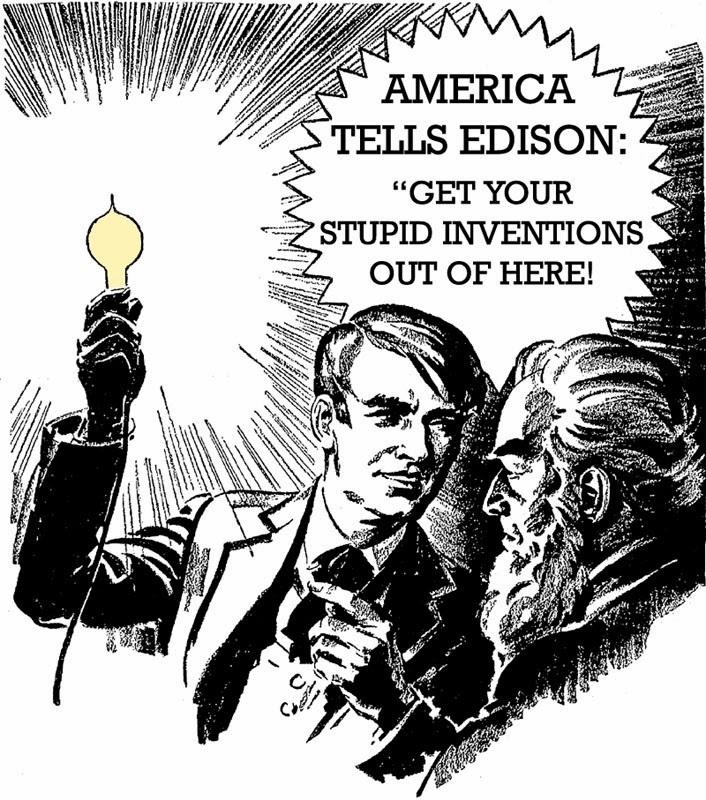 And gave Thomas Alva Edison the finger. Who was considered the smartest guy who ever lived when I was a kid. With Einstein coming in a close second. After them, no one else even came close. Not a living soul came in third.